This colt-starting thing is new to me, and I now have a whole new level of respect for the people who do this for a living every day with multiple horses. Like, it’s hard. This fall, I came to the point with my first 2-year-old that I really needed some help from someone who actually knows what the heck they’re doing. A two-day horsemanship clinic with reining trainer Todd Martin was the perfect push Winchester and I both needed to begin moving beyond just plunking around and start advancing his training and challenging his mind and body. By mid-November, Winchester had about 90 days of riding, a little more than 60 of those with me. I was happy with his progress and proud of how far we’d come together. He was soft and could stop and back, rate with my seat, loped around pretty decent, moved easily off my legs, rode around outside the arena safely, and I had control of his hips and shoulders. But everything still felt “piecey”—and I wasn’t quite sure how to begin putting it all together. I started looking for opportunities to ride with someone who could help me get past the plateau and start making progress. Photo by Jocelyn Marzella Photography. A friend I ran barrels with from back home reached out to me about a Todd Martin clinic she was hosting with another barrel racer friend of ours. She was bringing a 3-year-old and said it’d be perfect for Winchester and me, too. It was the best thing I could have done, as we turned a major corner together with Todd’s help and now have some really solid building blocks from which to work. My main goal heading into the clinic was to get Winchester more collected, rounded and driving forward. I felt like he was just riding around without a purpose or any impulsion to his movement. He’s still so young that I don’t expect the world of him, but I wanted him to start learning how to use his muscles and travel with some drive. I knew how to ask a finished, older horse to collect and get up under itself; a horse that already knows how to use its body. However, I was really struggling with this gangly, awkward colt that had no idea what I was asking or how to channel his movement efficiently. The first thing Todd suggested was to wear spurs with a longer shank. He explained how the longer your legs, the longer shank you need to clearly communicate with your horse without sacrificing correct leg position. I do have long legs—my little bumper spurs weren’t enough to reach under Winchester’s belly and encourage him to round his back and drive into the bridle. A bigger spur helps make my cues more clear with less effort. I honestly hadn’t thought much about why spurs are built different ways, but I did some additional research after the clinic and this article by Bridget Kirkwood “Form, Fit and Filigree” does a great job explaining the science behind how spurs are made and how to select the right spur. Todd rode Winchester the second day to show me exactly how to ask him to lift his back, soften at the poll and when to release the pressure. It was incredible what only 30 minutes with Todd at the walk did for him—I’d been trying to get to this point with Winchester for a month! That’s why they’re called professional trainers, folks. It was also really neat to watch Winchester’s thought process—in the beginning, he was frustrated and confused about why Todd was applying leg pressure while holding his mouth. He broke into a sweat almost immediately and pawed a hole in the ground in frustration. As soon as he gave in, lifted his back and softened in the poll, Todd released. He did this several times at a standstill before asking for forward motion at the walk. It didn’t take long for Winchester to catch on—my smart boy, I’m so proud of him. By the end of the session, he was rounding up as soon as Todd closed his legs and set his hands apart. This translated easily for Winchester at the trot and lope that week when I got him home. He’ll now collect and soften with my slightest cues. I ask him to hold it a little more each day, as it’s pretty physically demanding for a young horse just learning to use his muscles, and he’s strong enough now to lope a big, collected circle in frame. I’ve also noticed how much quicker, softer and physically stronger he is when just riding around—all from learning how to move with impulsion. Another thing Todd really stressed is that collection doesn’t stem from softness in the face, and that you can’t have collection without forward momentum. It’s also important to understand how to soften your horse’s body and not mistake a horse with its nose to its chest as a horse that’s collected. That’s why Todd asked Winchester to lift his belly and round his back first—a horse with a rounded back can engage its hindquarters and drive from behind, which will in turn create softness through the poll and chin. Ask for the body first, and the face will come. 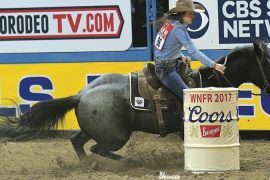 Another article that elaborates more on how to lift your horse’s back to achieve collection is Ron Ralls’ “The Back Lift” written by Abigail Boatwright, our Drill Of The Month in the December 2017 issue of Barrel Horse News. I refer back to it often. Collection looks different for every horse—it’s not necessarily a perfect frame, and you don’t have to ride your horse around framed up constantly, but they do need to know how to collect and come back to you when you ask, as Jordon and Justin Briggs explain in the article “Step By Step,” written by myself and Kailey Sullins, also featured in the December 2017 BHN. Photo by Jocelyn Marzella Photography.At the end of the clinic, I talked with Todd about my apprehension toward training my first futurity colt. Though Todd trains and shows reiners, the progression is pretty similar to barrel futurity horses, despite differences in the two disciplines and ages of futurity horses (reiners futurity at 3). I told him I felt a little lost having never done this before, because I had no benchmark from which to base my horse’s progress. Is this where he’s supposed to be at 90 days under saddle? Am I behind? He’s not as far along as other people’s colts, is it even worth it? Where do I go from here? Have I taught him enough to go on? He’s also really sweet—like, REALLY sweet, and I don’t want him to lose that, but I also want him to be tough and competitive. Todd said it was clear Winchester trusted and loved me, and that I could push him to be better without sacrificing his sweetness or breaking him down mentally. He reassured me that Winchester was right where he should be at 90 days, but it’s time to start challenging him. He gave me the great example of Einstein dropping out of high school at age 15. Most people didn’t realize how smart he was until much later—until he was challenged. If you don’t challenge your horse, you’ll never realize if you have an Einstein or not. You don’t just wake up and it’s your horse’s 4-year-old year and go, “Well, I have a futurity horse now!” You have to demand the best of your horse each day so you know exactly what kind of talent you’re taking to the arena. Otherwise, it’s a waste of time and entry fees. It takes a special horse to run at the top, but you’ll never know if you have something special unless you push them to be their best. Of course, the goal is never to break a horse mentally or physically, so it’s important to know your horse well enough to gauge how much is too much. Great athletes need coaches who push them past their comfort zone mentally and physically, cultivate their talent, and require them to strive for better performances, just like great horses need riders and trainers who do the same. It’s time to start challenging Winchester to use his mind and body to a greater capacity to see what he’s capable of, and I’m ready to rise to that responsibility. “What Do We Do Now?” is a blog series written by BHN’s associate publisher Savannah Magoteaux, managing editor Kailey Sullins and associate editor Blanche Schaefer, where they discuss the struggles, joys, and rewards of training young barrel prospects as amateurs juggling full-time jobs, all from a real-life perspective. Read more at barrelhorsenews.com under the “Blogs” tab.